These wild horse pictures capture the essence of what it is to be free. With no man to call them "beast of burden" or "work horse" they roam free on ever dwindling lands. 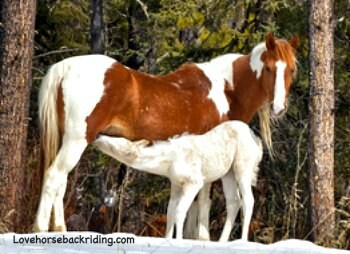 This mare and baby had their pictures taken in Canada. 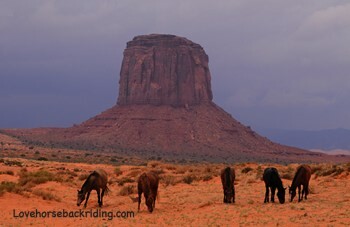 The wild horse can be found in regions across North America from Canada to the deserts of Utah. Bands of wild horses can be found in other countries as well. 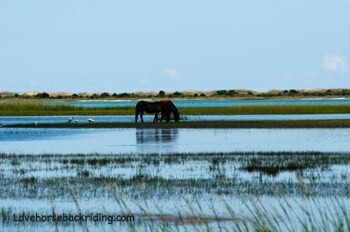 These wild horses are in the Outer Banks of North Carolina. Although American Mustangs are supposed to be protected by federal law, they often find themselves at odds with the very organization that is supposed to protect them. The BLM, or Bureau of Land Management decides how many horses the public lands can "support" and then uses helicopters to round up the rest for possible adoption to the public. This is supposed to protect the horses but the round up is extremely stressful. Chased by low flying helicopters, the horses are then herded into small corrals as a large group. Then the horses are kept in small, crowded holding pens and shipped around the country for potential adoption. The problem is, there is not near enough homes for all of the animals with the public. In addition, the surplus animals spend the rest of their lives in holding pens or worse, could be sold or adopted to those with less than admirable intentions. In the West, a champion for the wild horse has emerged! Madeline Pickens has done extensive meetings in Washington DC and with the BLM and others in order to champion an eco sanctuary in Nevada as an alternative to a life of 20+ years in a holding pen. Her plan is to make the facility a fun and educational destination for families, where you can learn about their heritage and see them running free. You can read more about Madeline's plan and how to help wild horses like the ones in these pictures here. The animals like the ones in these wild horse pictures hold a special place in my heart. I have been an owner of one for almost 15 years. You can see a picture of my American beauty third one down on this page and in other pictures throughout this site. Exit wild horse pictures to go back to the home page where you can find 100's of pictures, and articles about husbandry, drawing, anatomy and of course, riding!